Under 30? Interested in real / craft ale? 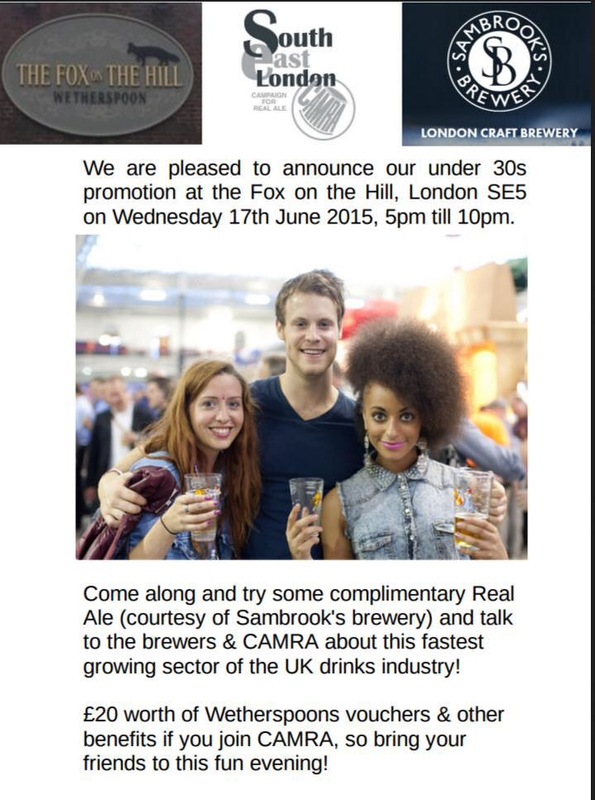 Join us at the Fox on the Hill, Denmark Hill on Weds 17 June for a free taster of beers from Sambrook's Brewery. SE London CAMRA have teamed up with the Fox on the Hill in Denmark Hill (@TheFoxontheHil1) to offer an evening aimed at those aged under 30. You don’t even have to be a CAMRA member (yet!) – just turn up on Weds 17 June any time between 5-10pm for a free taster of real ales from Sambrook’s Brewery (@SambrookAle), plus a chance to meet the brewer and members of your local CAMRA branch. If you join CAMRA on the night we’ll even buy you a free pint!